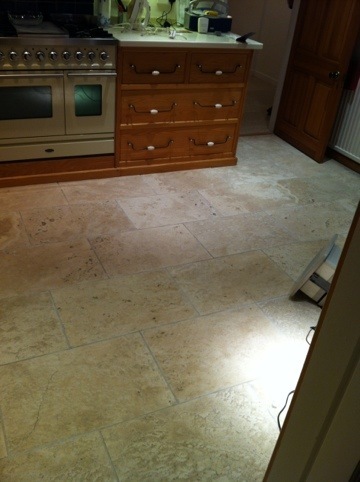 Travertine floors can be come hard to clean and maintain after a number of years of been down. The floor was sealed when laid but as it is now 15 years old the deal has started to fail and dirt had built up on both the tiles and grout. Please see picture below. To remove years of built up dirt like this an intensive cleaner was applied. This was left on to dwell for 30 mins and the solution works at breaking down the dirt and releasing it from the tiles and grout it has been stuck to for years. To remove the solution and dirt the floor was then cleaned with our unique high pressure extraction system. This blasts down hot water at high pressure and instantly extracts all the dirt and water away to the waste tank situated out side of the house. During the cleaning the floor looked as below. 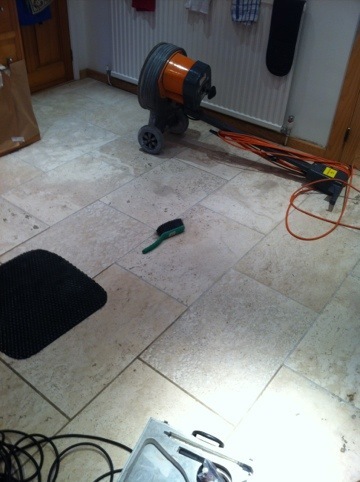 The grout was then given some extra attention to ensure that all the dirt had been removed in all areas. Edges and hard to reach areas ect. Once the grout was all clean, we then started to refinish the floor. The refinished the floor and remove all damage, scratches and imperfections diamond polishing pads were used. These diamond polishing pads grind a microscopic layer off the top of the tiles, leaving a new layer. This layer brings the tiles back like new and restores the factory finish as when the tiles were first laid. This customer wanted a very natural dull finish or honed as it is often call. Once the diamond grinding was completed all damage was removed from the tile and wonderful new like tiles remained. These times were then sealed using lithofin stain stop to prevent any further staining from any oil or water based stains. Once finished the floor looked as below and the customers were made up that their 15 year old floor like new again. 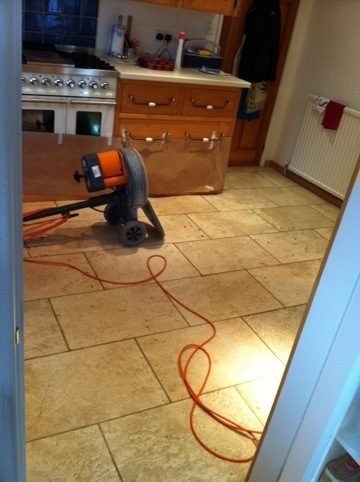 This entry was posted in hole filling, holes, how to polish, my travertine kitchen is full of holes, polishing, Travertine, travertine filler, travertine hole filler, travertine polishing, what has my travertine got holes in it and tagged Cheshire, cleaning, Lymm, Manchester, polishing, sealing, Travertine. Bookmark the permalink.